In the U.S. military, there are many types of medical personnel, known as medics. Across each branch, there are training programs that prepare these troops to save lives in clinic and combat situations. The terms medic, corpsman, doc, or combat medic are used interchangeably depending on the service. But the roles of medical professionals in the military vary. A “medic” can train to be side by side in firefights with infantry units or special ops teams, or they can become skilled as surgery technicians or physical therapists depending on what career path they choose. However, the combat medics in all the branches of service are warrior-medical-technicians and perform life-saving skills on the battlefield. Medics in the Special Forces Operational Detachment are first and foremost, special forces qualified. The 18D (18 Delta) medics in the Army special forces are highly trained Special Operations Combat Medics who attend training for more than a year, learning a variety of skills. These include dive medicine, altitude physiology, large animal veterinary care, dental extraction, orthopedics, and advanced trauma life support. They also receive training in local and cultural medical norms, for when they are deployed to areas with different views or traditions surrounding medical procedures. The first half of the 18D course trains in trauma medicine critical for combat medic operations. This is the Special Operations Combat Medic (SOCM) course and lasts about 6 months. Special Forces medics will attend for another 5 months and receive training in medical problems and diagnosing illness. Many of the highly capable SEAL, USMC RECON (Navy Corpsmen) will attend the 2nd half of the 18D course later in their careers. 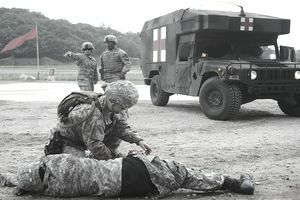 The Whiskey One (W1) course is a 22-week advanced medic course that prepares the 68W medic for duty in Ranger, SOAR units in the Army. An Army combat medic can also go for Special Forces Assessment and Selection (SFAS for short) and go for the entire 18-D course to become a special forces medical non-commissioned officer. Navy medics can specialize in a variety of medical skills from diving, aviation and clinical to Special Operations. Navy Corpsmen can serve aboard ships, clinics, and also go into the Marine Corps and be their Spec Ops unit medics. The Special Amphibious RECON Corpsman (SARC) attend the Special Operations Combat Medic (SARC) course which is the “short course” of the 18D training — 22 weeks. Later in their careers, many SARC and SEAL and SWCC medics will attend the second half of the 18D training. Just as a SEAL would be sniper trained or communications trained, SEALs will also get extra training to become a medic. However, when a unit does not have a combat medic, an 18D from Army Special Forces or Air Force PJs will be added to the group and perform mission essential tasks as the unit’s medic when needed. The Air Force Combat Medic (Pararescue — PJ) attend their own Special Operations Combat Medic Course for 22 weeks, then they must attend Pararescue Recovery Specialist Course for 20 weeks which teaches the variety of methods of rescuing injured personnel in every environment and situation. The PJ’s are qualified to be medics with special operations-trained paramedic certifications. They are fighters too and may be participating in combat when they'll have to rescue others behind enemy lines or in enemy territory. They are often augmented into SEAL platoons when SEALs do not have a medic. so they are fighter rescue specialists capable of flexibility in other Special Operations units. The regular medic in the Army is military occupational specialty (MOS) 68W, who works with infantry and other fighting units. The primary job of the 68W is medic duties, but these soldiers will carry weapons, body armor, ammo, and of course the trauma medical gear for typical injuries seen in combat situations. 68W Medic school is roughly four months long and is broken down into two phases. The first phase is training in CPR certification and emergency medical technician (EMT) certification. Phase two is commonly called the Whiskey side. Students will learn about advanced combat trauma medicine, which includes hooking IV's, advanced airway management, trauma management, and limited primary care. As a 68W combat medic, you will either deploy as a line medic, which means you'll be attached to a platoon of soldiers and you're responsible for their medical care; when they go into combat situations, you go with them. The Line medic is in the firefight, treating at the point of injury, and carries medical gear, weapons, ammunition, and body armor. The other duty you may rotate into is the Aid Station which is equivalent to working in a medical clinic. The Aid Station is the hub of all trauma treatment. You can receive multiple casualties and work way beyond your scope of practice. If you're assigned to a Brigade Combat Team, you may get a few months of each. 68W Army Combat Medics can also go into other Special Operations units within SOCOM, the Ranger Regiment, SOAR, but are required to go through the W1 Special Operations Combat Medic course first. There are no shortages of jobs for the military medic. Depending on how you want to serve, you'll have plenty of opportunities.